For people struggling to lose weight, there truly is no magic bullet (as annoying as that term is). But scientists at the University of North Carolina at Chapel Hill may have discovered a beam of light that could help obese and overweight people stop overeating. In the experiment, the researchers gathered up some lab mice that had been genetically modified. 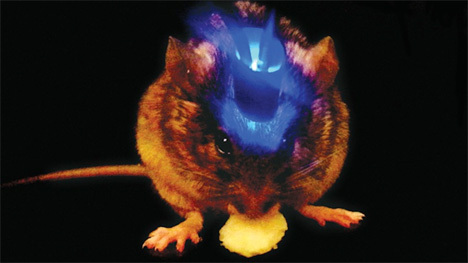 The modification caused a small group of brain cells to react in different ways to light. Of specific interest were the neurons that control the body’s appetite. There were two groups of mice: one whose relevant neurons would “shut off” when exposed to light, and one whose relevant neurons would “switch on” when exposed to light. When lights were shone into the brains that were programmed to shut off, the mice refused to eat anything as long as the lights were on. In the other group, the mice refused to stop eating as long as the lights were on. The mice reacted in these ways regardless of their physical hunger. The results suggest that there may be a way to map similar pathways in the human brain. The technique could be used to treat eating disorders in humans, including anorexia and chronic overeating.